Also pictured are Mick Jones and Colin Mayhew (back row) with Kevin White and Shane Smith (front row). The money was raised at our recent charity day held at Bungay Football Club in May. 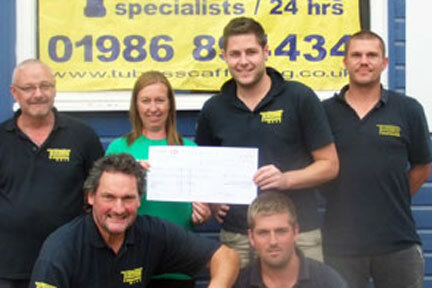 Mandy explained that the funds would be going towards a new unit and that MacMillan Cancer Support were very grateful for another donation from Tubes Scaffolding.